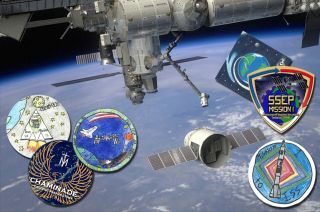 Student-designed mission patches, including those pictured, will fly with students' experiments on SpaceX’s first Dragon capsule to launch to the International Space Station. Students' science experiments are about to make history, launching to space on the first attempt by a U.S. commercial company to send a spacecraft to the International Space Station (ISS). And like many other historic space projects, the students' payloads packed on board SpaceX's Dragon capsule have their own specially-designed mission emblems, which are also flying to the orbiting laboratory. Set to launch before dawn on Saturday (May 19) from the Cape Canaveral Air Force Station in Florida, the students' experiments, along with other cargo, will fly with SpaceX's Dragon unmanned cargo craft as it tries to do what only government-owned vehicles have accomplished to date: approach and link-up with the space station. If successful, the mission will symbolize a sea change in the way the United States approaches space travel, with SpaceX and other companies vying to take cargo and crew members to orbiting complex. Should that happen, then the 15 experiments comprising "Aquarius" — the name given to the National Center for Earth and Space Science Education's Student Spaceflight Experiments Program Mission 1 to ISS — will be among the first payloads delivered to the station on a commercial cargo craft. The competition among students to fly experiments was stiff, as was the contest to design their mission patches. A total of 779 student teams submitted proposals for the 15 science slots and nearly 5,000 students offered 2,299 insignia ideas from which just 22 were chosen. Ironically, none of the almost two dozen student mission patches that were selected to fly depict the vehicle that their experiments are riding on. Aquarius, which utilizes liquid mixing tube assemblies that function similar to commercial glow sticks, follows two similar student flight opportunities arranged by NanoRacks LLC on NASA's final two space shuttle missions. Further, Aquarius was first slated to fly on a Soyuz spacecraft. When the students' experiments were re-manifested, they went from launching on the Russian rocket to the SpaceX Dragon. The Soyuz and space shuttle appear on quite a few of the patch designs, as do more rudimentary rockets, but the Dragon's gumdrop shape is nowhere to be found. Many of the emblems do however, feature the International Space Station as their destination. The designs, which range from crayon-colored creations to computer-assisted drawings, also include representations of the Earth, moon and Mars and the American flag. One of the emblems does include a falcon, but rather than represent the rocket that is launching the Dragon capsule, the Falcon 9, the depiction of the bird is borrowed from the school's mascot. Like the experiments they represent, the patches hail from student teams spread across the U.S.. Selected patches symbolize schools in California, Connecticut, Washington D.C., Indiana, Iowa, Maryland, Massachusetts, Nebraska, Ohio and Texas. The students' experiments range in focus from the effects of microgravity on bacteria to the speed of wine making — fermentation — in space. Other experiments examine the growth of fish and spiders in weightlessness and the use of cacti excretions to purify water. The Aquarius package will stay in space for just under six weeks before coming back to Earth on Soyuz TMA-03M, the same spacecraft returning three ISS crew members on July 1. The students' patches will also make the round trip, and will be embossed with a certification stating that they flew in space. Each school community was invited to design and fly two mission patches. The emblems had to measure 4-inches by 4-inches and could only be produced on paper. The Dragon that is bringing the experiments and patches to space will make its own return to Earth about a month earlier. Assuming a May 22 berthing with the station, its re-entry and splashdown in the Pacific Ocean is expected on May 31.